Just got back from the Hajj exhibition that is being held at the British Museum. 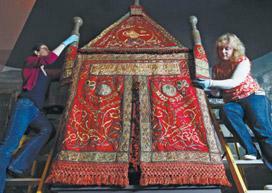 Apparently, it is the first in any museum in the world to focus on the pilgrimage. I thought that the artefacts in the exhibition would be seen within an hour, however we were there for almost 3 hours as there was much to see! Then you hear the adhaan (call to prayer). 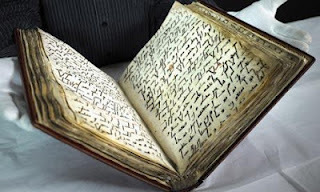 The exhibition houses manuscripts such as a copy of an 8th century Qur’an. There is a focus on the different historical routes taken to undertake the Hajj, such as Kufa to Mecca, Timbuktu to Cairo and then Mecca, Damascus to Makkah, Jeddah to Makkah. The mahmal does not hold religious purpose, but was placed on top of the camel when the procession was leaving for Makkah and inside a copy of the Qur’an was placed. (Don’t know if they actually took the mahmal into Makkah or brought it back after the procession had left the local town/village). Here is a link to a short video containing part of the grand procession leaving Cairo in 1918! The exhibition also looks at the appointment of Thomas Cook in the 19th century by India as the official hajj travel agent. We saw a Hajj ticket dating from 1886. There was part of a kiswa on display, curtain for the door of repentance and a cloth that was meant to be used (or was indeed used) to cover the Prophet Muhammad (saw’s) grave. We got to watch a 5 minute film on the rituals of Hajj too in a sort of mini cinema within the exhibition! 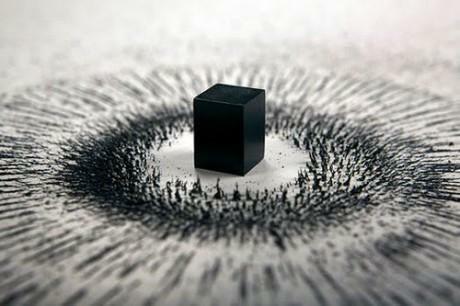 Art work by Ahmed Mater depicting pilgrims circumambulating the Ka’ba by using a magnet and pieces of iron. All in all it was well worth it and I would thoroughly recommend it to anyone - Muslim and non-Muslim alike. Hurry as the exhibition's final date is on the 15th of April. If you cannot make it here is a link to some pictures that were displayed at the exhibition. Enjoy! Have you been to the exhibition? What did you think? Leave a comment.